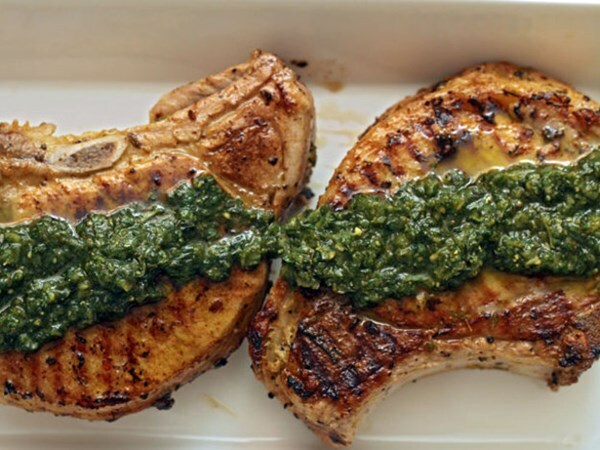 Delicious - a very good technique for pork chops. Pesto was nice, but not necessary, addition. Very flavorsome, with or without pesto. Probably wouldn't bother with the pesto next time. The marinade for the chops was flavoursome enough. I substituted lemon thyme for thyme. Very nice. We used the grill pan, did not scrape the marinade off. I made the pesto, close to Jamie's recipe, but couldn't imagine pesto with 1/4 clove garlic (I kept thinking maybe he meant 1/4 head of garlic, but no). I used one clove, less than I usually use. I did add the optional lemon squeeze, which I've never done in pesto before, and I thought it struck a nice harmony with the lemon zest in the marinade. Served the chops with olive bread and a salad. I think that garlic mashed potatoes would go well with the chops.